by Martin Malden on 28 March, 2011. Last updated on 19 December, 2018. A while ago I read this article on Problogger about how Reddit can be a source of focused, targetted website visitors. In that article Antriksh Yadav gives some very useful hints on getting the best out of Reddit – enough to prompt me to give it a try. Despite it being early days (I’ve only been using Reddit for 3 weeks) the results so far are encouraging. As Antriksh described in that article, the trick is to find the categories within Reddit (confusingly, also called reddits but with a small ‘r’) that most closely match the subject of your site. Once you’ve found those (and there are a heck of a lot of them) you can interact with others who follow that reddit and build up a network of contacts. For example, I follow the WordPress reddit. According to the site, roughly 1,900 other people also follow it. This is not the biggest group of followers, to be sure, but if you’re covering WordPress tutorials on your site they’re highly targetted. So how to get the best out of Reddit? Getting the best out of Reddit firstly requires that you find relevant reddits to follow. Once you’ve set up your account you can do this by clicking the edit link at the right end of the tool bar, and then doing a search for reddits. 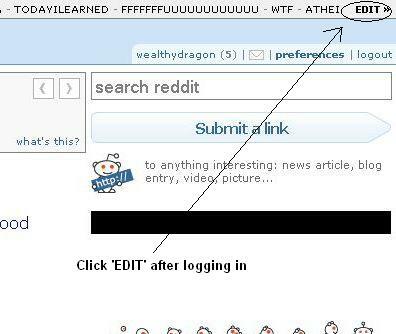 Once you’ve found your reddits, add them to your toolbar by clicking the ‘+’ sign in the left-hand margin. Then just interact exactly as you would in any other social media setting. Don’t spam. Do interact and help where you can, without expectation of a payback. Post links that are relevant to the reddit you’re posting them in. All the usual stuff. I log in just once, possibly twice, a day to see if there are any questions I can answer. Where I can, I do. And I’ve submitted more answers (comments) than links in the short time I’ve been there. The links I’ve submitted are all tutorials. And each experienced an immediate jump in visitors immediately after submitting them. 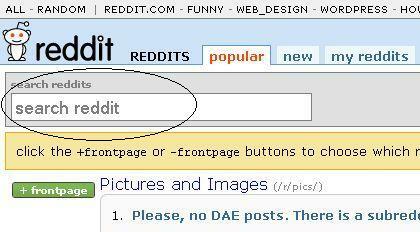 And best of all, those tutorial links are now appearing in the Reddit search results. This is bringing a second (and unexpected) round of visitors. I’ve read complaints that Reddit is dominated by a few power users, and that’s probably true. A bit like Digg, your submissions climb to the top of the first page of your chosen reddit as a result of votes – up or down, like Digg’s thumbs up or thumbs down. So it’s easy enough for someone who wants their own submission to rank above yours to vote your submission down. I did experience this with one of my submissions. I deliberately chose the tutorials that had the most comments and the most traffic on this site (the most successful articles) for my first two or three submissions, and one of them got more votes down than up. Given that it received lots of positive comments on this site I came to the conclusion that the down votes were more tactical than genuine. So it left the first page of the WordPress reddit pretty quickly, but it still appears in the Reddit search results. That reinforced my philosophy of spending more time answering questions than submitting links – at least initially. It will help to build up a level of acceptance. Over time I’ll gradually start submitting links more regularly. Anyway, if you haven’t looked at Reddit as a source of traffic before, it’s worth checking into it. In addition to what I’ve written here, check out Antriksh’s article on Problogger for more tips. This is great. I’ve used reddit for social bookmarking but I wasn’t aware of the more advanced social media aspect of reddit. I actually like reddit primarily because they can drive decent traffic to a site and it’s extremely easy to use. Thanks for adding the screenshots of how you get social in reddit. That’s probably the most helpful rather than explaining what to do in text. The downside to this social aspect of reddit is it’s yet another social media outlet to manage (after Twitter and Facebook). Is there any time left to actually write for our own blogs? I think a good point to keep in mind is not to try and do everything. Experiment for sure (and your article offers an excellent method for using reddit to it’s fullest potential), and then focus on those platforms that generate the best results. Yes – important point about not over-stretching yourself with too many social media sites. They can destroy your time..! Social Bookmarking sites are great. I haven’t used Reddit yet going to join them. I use Stumbleupon to get traffic. You’re welcome, Sean, and thanks! I believe Twitter and Facebook are counted as referring websites when you receive visitors from unexpected websites. As you referring to Reddit, this is after all and social networking website. I love this website by the way! I’m impressed with this great info! Your welcome! Hope you have a fab day!